A 3-year-old male with history of autism fell down the stairs. The child was limping and refused to bear weight after the fall. Hip radiographs which included the pelvis were obtained to exclude fracture. On frontal hip radiographs, no fracture was present. Incidentally, linear areas of sclerosis were present in the left iliac wing, radiating from the middle portion of the iliac wing towards the crest (Figure 1). Despite no traumatic abnormality, the etiology of the sclerosis was uncertain. At this time, the differential diagnosis included artifact, prior trauma, bone dysplasia, and neoplasm. 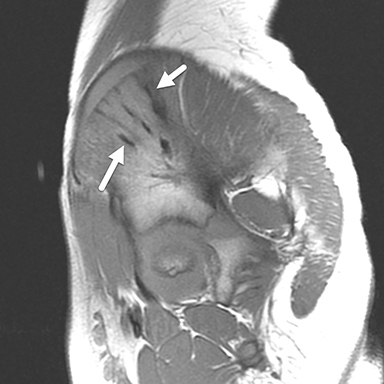 An MRI scan of the pelvis without contrast was obtained because neoplasm remained in the differential diagnosis. 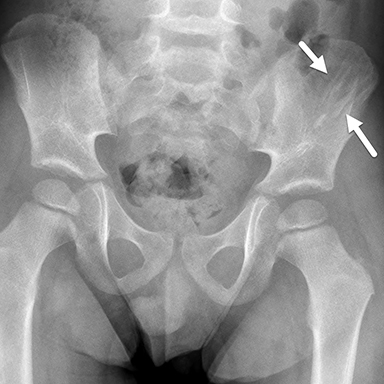 The exam showed the serpiginous areas of marked T1 and T2 hypointensity in the left iliac wing corresponding to the linear areas of sclerosis on the radiograph (Figure 1). The serpiginous markings matched the signal of cortical bone and were oriented in a fan like distribution parallel to the long axis of the iliac bone. Osteopathia striata should be recognized by the radiologist as a “don’t touch” lesion. Although readily identified in the long bones, when it occurs in less common sites, such as the iliac bones, it may be more challenging to diagnose. The fan-like appearance of the striations seen in the iliac bones in this case has been previously described on radiography, with the orientation of the striations mirroring the growth of the bone.2 In that case, the linear striations were more apparent using cross-sectional imaging and the correct diagnosis was able to be made. Osteopathia striata is a benign entity, although rarely it may be associated with other slerosing dysplasias or disorders. Consider the diagnosis even in unusual sites such as the iliac bones if linear striations of cortical bone are evident. Gehweiler JA, Bland WR, Carden TS Jr, Daffner RH. Osteopathia striata—Voorhoeve’s disease. Review of the roentgen manifestations. Am J Roentgenol Radium Ther Nucl Med. 1973 Jun;118(2):450-455. Greenspan A. Sclerosing bone dysplasias--a target-site approach. Skeletal Radiol. 1991;20(8):561-583. Vanhoenacker FM, De Beuckeleer LH, Van Hul W, Balemans W, Tan GJ, Hill SC, De Schepper AM. Sclerosing bone dysplasias: genetic and radioclinical features. Eur Radiol. 2000;10(9):1423-1433. Magliulo G, Parrotto D, Zicari AM, Zappala D, Lo Mele L, Primicerio P, Marini M. Osteopathia striata-cranial sclerosis: otorhinolaryngologic clinical presentation and radiologic findings. Am J Otolaryngol. 2007 Jan-Feb;28(1):59-63. Viot G, Lacombe D, David A, Mathieu M, de Broca A, Faivre L, Gigarel N, Munnich A, Lyonnet S, Le Merrer M, Cormier-Daire V. Osteopathia striata cranial sclerosis: non-random X-inactivation suggestive of X-linked dominant inheritance. Am J Med Genet. 2002; Jan 1;107(1):1-4. Frey C, Towbin RB, Towbin AJ. Osteopathia striata. Appl Radiol. 2019;48(2):38-39. Prepared by Dr. Frey while a Radiology Resident at the University of Cincinnati and affiliated with the University of Cincinnati College of Medicine, Cininnati, OH; Dr. Richard Towbin while a faculty member at Phoenix Children’s Hospital, Phoenix, AZ; and Dr. Alexander Towbin while a faculty member at the University of Cincinnati and affiliated with the University of Cincinnati College of Medicine, Cincinnati, OH.